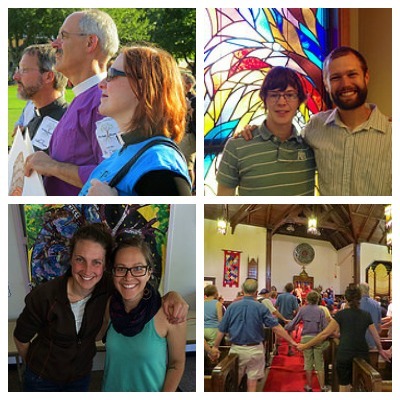 While EcoFaith Recovery Initiatives are sponsored by EcoFaith Recovery as a way to cultivate deeper engagement with EcoFaith’s Practices for Awakening Leadership by leaders from many different faith communities and denominations, “groups” refer to ongoing gatherings, teams or meetings that are sponsored by the faith communities themselves. Such groups may have very different purposes where it concerns the faith-rooted public action they seek to inspire for the recovery of human life and the healing of God’s creation. However, all groups listed below engage in the Practices for Awakening Leadership in a regular, explicit and intentional way as a significant means of advancing their goals. (For example, one sample meeting format for carrying out a congregational based group can be found at this link). All of the groups below welcome you to try them out to see if their approach is right for you. Nov 30th HOPE meeting will focus on solidarity with Standing Rock and the No DAPL and feature speakers who have recently returned from Standing Rock. See attached photos of the Medical Bunk Bus which will be leaving early next week. HOPE, an ecumenical eco-focused gathering in Southwest Portland. HOPE is an eco-faith group committed to building relationships, educating ourselves and others, and taking action for climate, social and economic justice. We are members of the Climate Action Coalition and participate in their meetings and actions. The group’s name is an acronym for Healing Our Precious Earth. Come as you are, be encouraged with song, authentic listening and sharing, and uplifting interpersonal relationships. Notice your sense of hope being rekindled and deepened. Experience the excitement of this community forming around you. And consider the resulting opportunities to participate in Earth-healing actions within the local, regional and broader movement. HOPE is rooted in its participant’s moral-spiritual grounding, in relational community organizing, and in the teachings Dr. Martin Luther King. It will draw on principles of EcoFaith Recovery and progressive Christian spirituality. Meetings have time for prayer, song, relationship building, education, discussion and planning for actions. Sue Koger and Pastor Janet Parker will be leading an adult education class on the EcoFaith Recovery Practices for Awakening Leadership at First Congregational United Church of Christ. The first meeting was at 9 am on Sunday, December 7th. This served as an introduction to those of you who aren’t familiar with these practices, and an opportunity for deepening for those of you who were able to come to the potluck at Sue’s home in November. All are welcome! To further deepen your experience with the Practices for Awakening Leadership through an EcoFaith Recovery Initiative, you will find more information about how you can join others from across congregations and denominations at this link. Would your community of faith like to sponsor a group engaging regularly and explicitly in the Practices for Awakening Leadership and have that group listed on this page? If so, we welcome you to please be in touch with Pastor Robyn Hartwig at PastorRobyn@ecofaithrecovery.org!